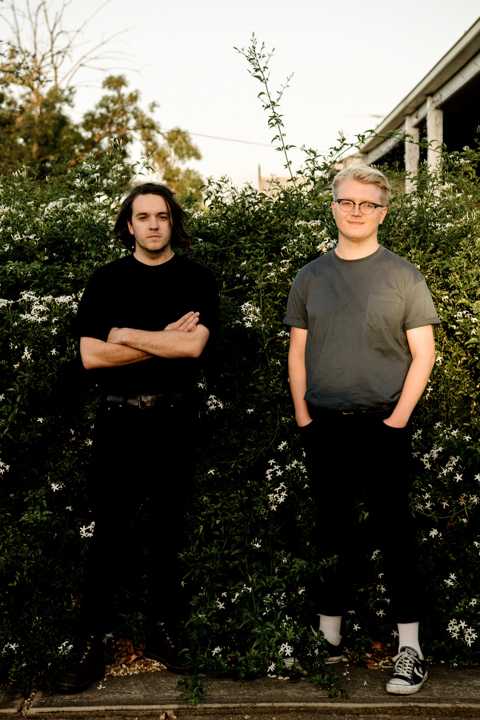 With Planet Shhh, West Thebarton's Josh Healey and Tom Gordon are making use of their extensive industry networks to make Adelaide a national hub for alternative music. Joshua Healey and Thomas Gordon are familiar faces on the local and national music circuit. Both are members of the seven-piece west side garage rock collective West Thebarton, and they each keep busy in their own bands, Sleep Talk and Horror My Friend. Planet Shhh officially launches on Saturday, 13 April at Chateau Apollo. Doors open at 8pm, and tickets are $10 +BF and available via Planet Shhh. Their latest project, Planet Shhh, will see the duo putting their extensive networks within the industry to work for bands other than their own, as they move into the realm of music management. Planet Shhh was publicly announced last week, but both Tom and Josh have already spent a significant amount of time working with bands behind the scenes. Tom first started working with the now disbanded group Siamese in 2016. “That was very, very casual. I felt like I was in a position in the Adelaide scene where things were going well for us on a national scale, both for West Theb and for Horror, and Siamese were 100 per cent my favourite band in Adelaide at the time,” Tom says. Tom organised for Siamese to record their first single, Computer Patient, and developed a release strategy, garnering an unprecedented level of attention for the band, including airtime on Triple J. By late 2017, Tom and Josh decided to work together under the banner of Planet Shhh, and drafted in the now sole artist on their roster, DIY alternative pop outfit Paradise Club. “When we heard their first song, it was immediately ‘Yes! This is awesome, we want to work with that,’” Tom recalls. Paradise Club had already released two singles and planned to release an album by the time Planet Shhh made contact, but, like Siamese, they were not getting the attention they’d hoped for. Tom and Josh plotted their next release, contacted publishing and PR contacts, and got the band booked for the opening slot of the 2018 Adelaide Laneway Festival, which then scored them a support slot touring with Sydney band Endless Heights. The duo decided to go public with Planet Shhh after Paradise Club’s success proved their model worked, and they were soon after spurred on as recipients of the Robert Stigwood Fellowship. “They choose three industry professionals within Adelaide to mentor and give money to, and that… solidified that we were doing something good, and that we should continue it,” Tom says. There are no guarantees in music management, but through the experience of their own bands, Josh and Tom have seen the many ways that management can work for artists. And through working with Adelaide acts, both Josh and Tom hope to build on the steadily growing confidence of the local scene. “I really like it when bands stay here, and representing where you’re from and actually being an Adelaide band is important, because you can be successful in Adelaide. There’s nothing stopping you,” Josh says. “Every band that does well nationally makes it one step easier for the bands at home as well,” Tom continues. “I do think that the bands like Bad Dreems, and West Theb, and Horror, Tkay Maidza, and to a point Sleep Talk as well recently, [signing] with Unified, we’ll probably reap the rewards of that as well. Both musicians see Adelaide as a thriving hub for alternative music, and they hope to help solidify that movement as part of our city’s cultural identity. “The Seattle movement with Sub Pop was started by a couple of guys who just loved bands in Seattle,” Tom says. “They would just put out records of bands that they loved, and it wasn’t about getting on the radio – the music they put out was extremely alternative. “I want to be working with bands because we love it, regardless of what the music is. If they’re writing seven-minute songs but they’re incredible, that’s awesome. “I want to see Adelaide become a hub for alternative music to a point where it’s not about getting on the radio, it’s not about carving your sound into something that’s successful, it’s about doing what you love. And my personal belief is that if you do things that you really believe in, then the right people come to you. 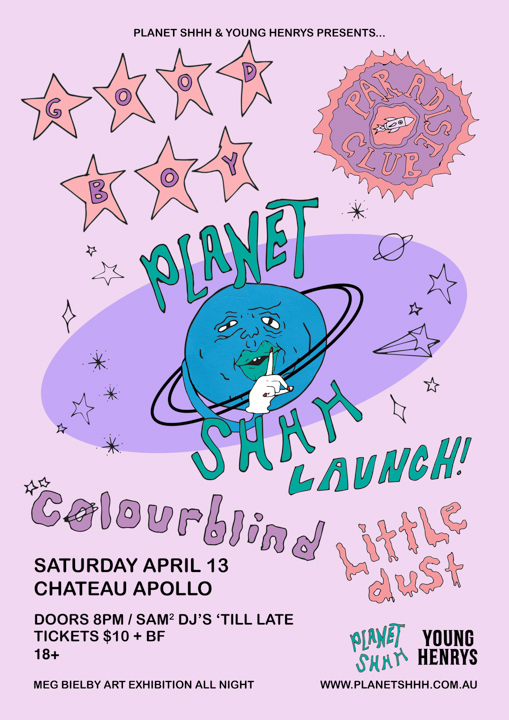 Planet Shhh will officially launch on Saturday, 13 April with an event at Chateau Apollo featuring headliner Good Boy (above) from Queensland, Paradise Club, and two more local acts, Colourblind and Little Dust. The event will also host an exhibition of visual art from Adelaide illustrator Meg Bielby. The event will be the first opportunity for people to experience, and hopefully connect with Planet Shhh as a brand. “We want to create a culture where Planet Shhh signs an artist and immediately people go ‘Alright, I’m going to listen to this,’ regardless of whether they know who they are, because they know if Planet Shhh signed them, they must be good,” Tom says. Artist management will always be the core of what Planet Shhh does, but at this stage Josh and Tom are not limiting the scope of what the business could become. “We want to integrate ourselves into the Adelaide music scene, however that may be,” Josh says. Keep an eye on Planet Shhh’s social media at the link for future announcements of signings, releases, and upcoming events. While CityMag had Tom and Josh’s attention, and in the spirit of our latest print edition, themed around jobs and employment, we thought we’d get some tips on how bands can attract right kind of artist management. CityMag: How should bands first approach a management company? This is generally a good rule for engaging industry – whether it be booking agents or labels or whatever – is, do your thing, talk to people and bring them in and engage them, but never push too hard for that. You want someone who organically loves what you do, and you never want someone who’s like ‘Ok, alright, I’ll do it.’ You want them to want in. Josh Healey: Just plant the seeds early. Exhibit A: West Theb, it was having that tiny 10-second conversation, [and] six months later a conversation picks up again. With West Theb, our management is Tank – his name’s Chris [Gilks] – and Heath [Bradby] from Fidelity Corporation, they’re a Sydney-based management company, and they manage Thelma Plum and Karnivool, so two pretty big Australian acts. We started West Thebarton in 2013, and I reckon in about 2015 or 2016 was when we stared doing the Big Sound showcases up in Brisbane. We played one year and we just had a few people watch us in a room, and one of them happened to be Heath. [He] went to the toilet and heard a guy in the room be like ‘You see that West Theb band? They were sick,’ and after that we caught his eye. He emailed us the next day and then six months later he returned to see us at the show in Sydney, and from then it was developing those conversations. They didn’t want to leap into something that they may regret later, so they took their time and saw us a few more times, and then made that decision to actually sign us on. That was around March or April 2016 that happened, and then in June we signed a proper agreement for them to work with us. TG: With Horror My Friend, we signed with Daniel Radburn, who runs Rad Music, and he also manages Hockey Dad and he manages RAT!hammock and all of these kind of bands, and that was purely from playing a show at his bar. He saw us play, the next day we had an email saying ‘Hey, do you want to work together?’ Artist management can work so easily and so quickly, yet it can be such a drawn-out thing as well, of sussing each other out.